CALGARY - Josh Prokop broke a 2-2 deadlock at 19:37 of the third as the Hitmen beat Swift Current. Riley Stotts and Egor Zamula also scored for Calgary (13-14-3). Jack McNaughton made 11 saves for the win. Isaac Poulter stopped 42 shots as Ethan O'Rourke and Joona Kiviniemi scored for the Broncos (5-22-2). SASKATOON - Tristin Langan had a goal and two helpers as Moose Jaw slipped past the Blades. Brayden Tracey and Luke Ormsby also scored while Brodan Salmond made 33 saves for the Warriors (16-6-5), who erased a 2-0 lead. Eric Florchuk and Josh Paterson built up a two-goal lead for Saskatoon (17-10-3). Nolan Maier kicked out 22 shots in a losing cause. BRANDON, Man. - Cole Fonstad had a goal and an assist as Prince Albert built up a five-goal lead and cruised past the Wheat Kings to improve to 20-0-1 in its last 21 games. Eric Pearce, Sean Montgomery, Noah Gregor and Ozzy Wiesblatt also scored for the Raiders (27-1-1), who were coming off a shootout loss that snapped their 19-game win streak. Donovan Buskey had 24 saves for the win. Connor Gutenberg and Ben McCartney scored late as Brandon (14-8-6) had its four-game win streak come to an end. Jiri Patera turned away 36 shots in defeat. Winger Cole Reinhardt was ejected for checking from behind at 16:47 of the third. 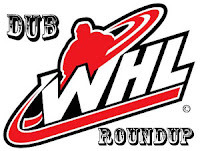 SPOKANE, Wash. - Luc Smith and Riley Woods each had two goals and assist as the Spokane Chiefs defeated the Lethbridge Hurricanes 6-2 on Friday in Western Hockey League action. Jake McGrew and Cordel Larson also scored to help the Chiefs (15-10-4) snap a three-game slide. Igor Merezhko and Jackson Shepard scored for the Hurricanes (15-9-5), who entered the night 6-0-1 in their last seven games. Bailey Brkin made 28 saves for Spokane. Reece Klassen combined with Carl Tetachuk for 23 saves for Lethbridge. The Chiefs went 3 for 4 on the power play while the Hurricanes went 1 for 3 with the man advantage. KENNEWICK, Wash. - Dillon Hamaliuk scored the go-ahead goal at 1:42 of the third as Seattle handed Tri-City its fifth loss in a row. Zack Andrusiak, Simon Kubicek and Matthew Wedman also scored for the Thunderbirds (10-13-3). Cole Schwebius kicked out 21 shots for the win. Nolan Yaremko had the Americans (14-12-2) goal. Beck Warm stopped 39-of-42 shots in a losing cause. PORTLAND, Ore. - Robbie Fromm-Delorme scored the eventual winner early in the second as the Winterhawks cruised to a win over Prince George. Joachim Blichfeld, Seth Jarvis, Cody Glass and John Ludvig also scored for Portland (17-10-2) as Shane Farkas made 23 saves for the win. Josh Maser and Vladislav Mikhalchuk scored for the Cougars (11-15-3). Taylor Gauthier stopped 25-of-30 shots in a losing cause. KELOWNA, B.C. - Roman Basran only had to make 16 saves for the shutout as the Rockets blanked Victoria. Lane Zablocki scored the at 8:31 of the third for Kelowna (14-15-2) and Nolan Foote added an empty-netter. Griffen Outhouse stopped 30-of-31 shots for the Royals (13-12-0).